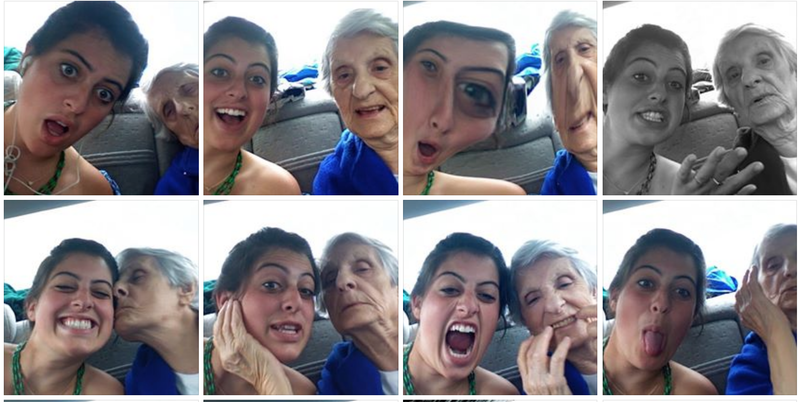 #Bubbe. Bubbe interacted with us, her grandkids, almost solely via food. She fried blintzes for us, she peeled potatoes with us, she scooped us ice cream, she counted the chocolate chips that went into each cookie she force-fed us. We schlepped her to the grocery store, we brought her butter, we enlisted her in apple-chopping, we ate and ate and ate. Bubbe showered us with indulgence. She conveyed gratitude, love, power, comfort, something, everything, through food. We — I — inherited this mechanism to cope with my own gratitude, power, drive, something. It feels good to make things. Why do you make over 300 hamantachen at once? Why do I cook for 20 when I’m hosting a dinner for 5? Why are the only posts in our family whatsapp group pictures of food and injuries from pushing ourselves too hard? Is it genetic that we, the grandkids, can’t sit still… that we thrive off of extremes? That we wake up one day and decide that baking 99 recipes will be fun? Your inheritance was an appetite for survival… is it part of ours too? Our #blessings are also our neuroses. Yes, food is metaphor. Our approach to it reflects our anxieties, values, loyalties. It shows our evolution. Around this time of year during my childhood, I’d be sick from Bubbe’s hamantaschen. 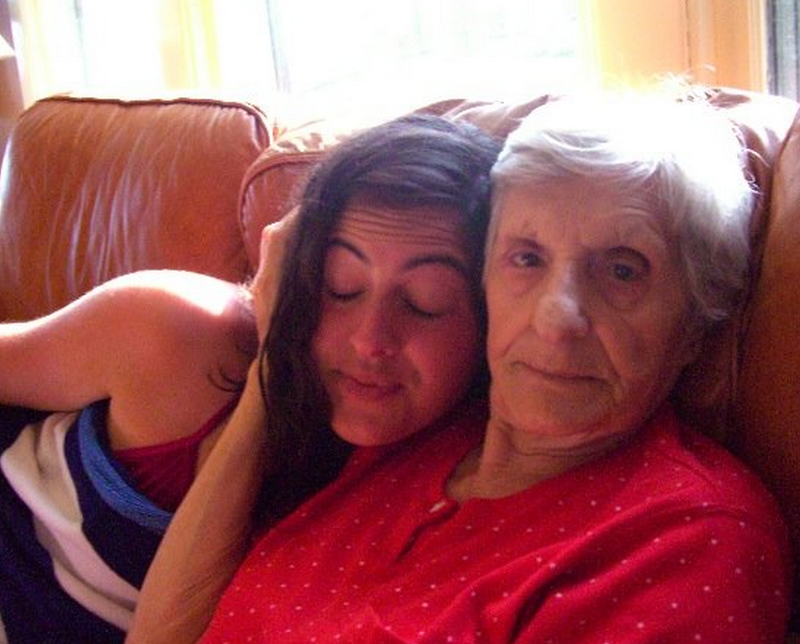 As soon as the latke parties ended, she’d bust out the flour, jam and “hoil.” In her later years, she made Valentines Day cookies out of hamantachen material. She’d shape the dough into little hearts that she copied from playing cards, and topped them with strawberry jam and chocolate chips. I know she copied the heart shape from playing cards because one year she messed up and made cookies in the shape of spades. She still called them hearts. It was like how she used to make pizza with Velveta cheese. I decided to pull a Bubbe and mix two cultures into one: I made traditional Persian cookies and added my own “filling” to retain the feel of hamantaschen. 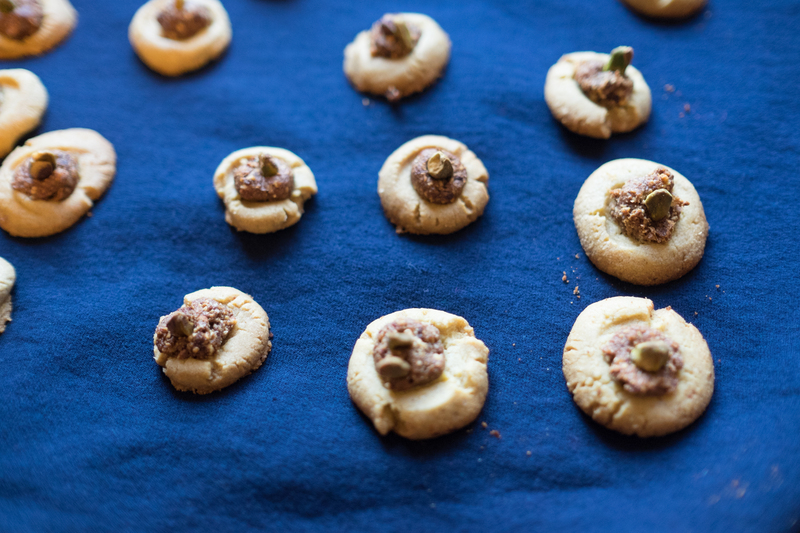 These cookies, called Nan-e Nokhodchi, are delicate gluten-free Persian cookies, usually decorated with a single pistachio. 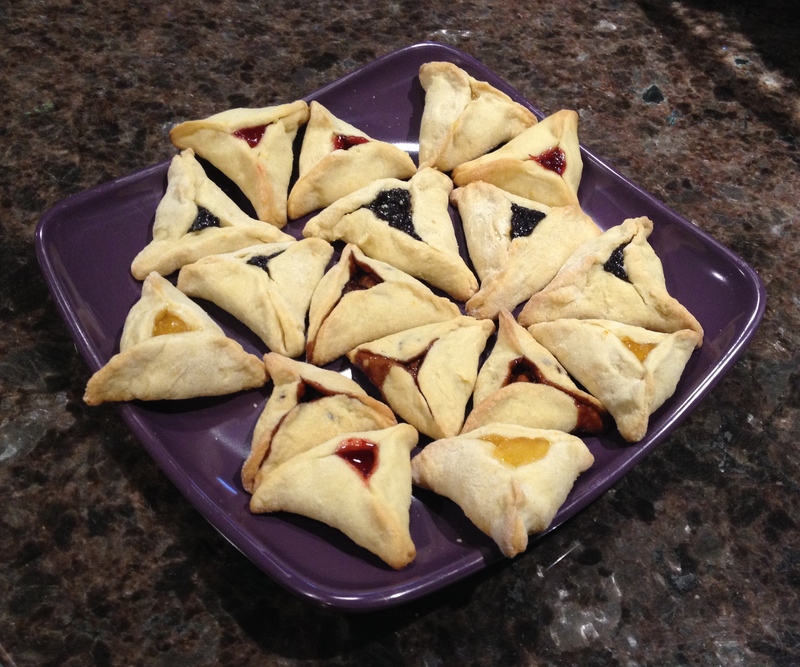 They are a perfect accompaniment to normal hamantaschen or a holiday alternative for those who keep a gluten-free diet. Cream butter with sugar, egg yolk, cardamom, and rose water in bowl. Add chickpea flour and mix well until lumps dissolve. Cover the bowl with foil or plastic wrap, and place in fridge to sit for at least one hour. 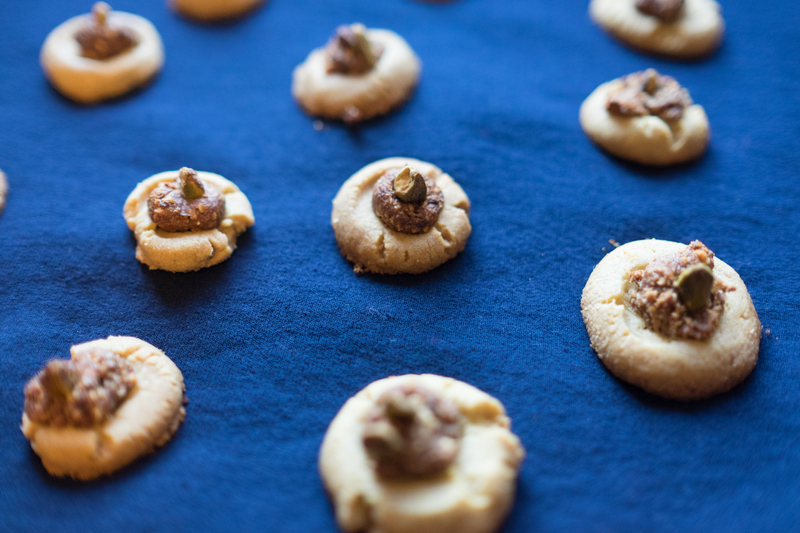 In the meantime, combine almonds, dates, cardamom, rose water and sea salt in a food processor until a paste forms. When dough has sat for one hour, preheat oven to 300 degrees and line baking sheets with parchment paper. Using a teaspoon, scoop a spoonful of dough from the bowl and place into your hand. Roll the dough gently forming a ball in your hands. Press your thumb into the middle of the ball to form a dip in the cookie. This will flatten the cookie. 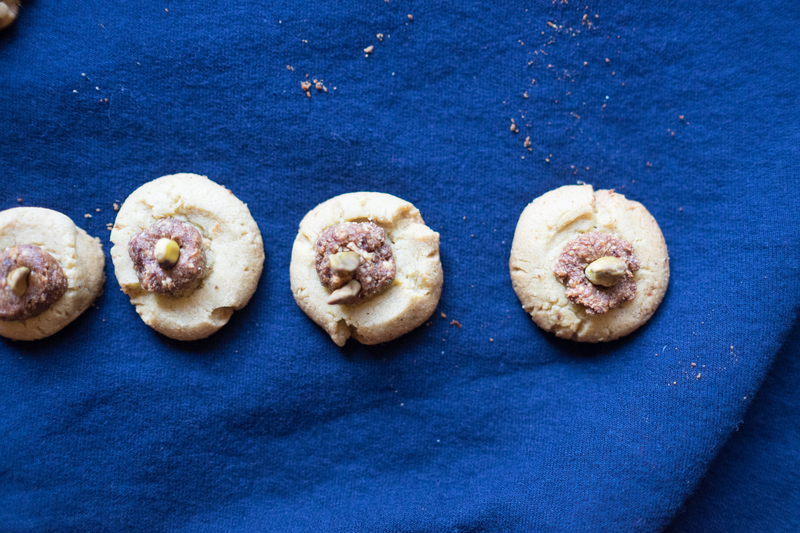 Fill each “thumbprint” with the date and almond paste and top with a single pistachio. 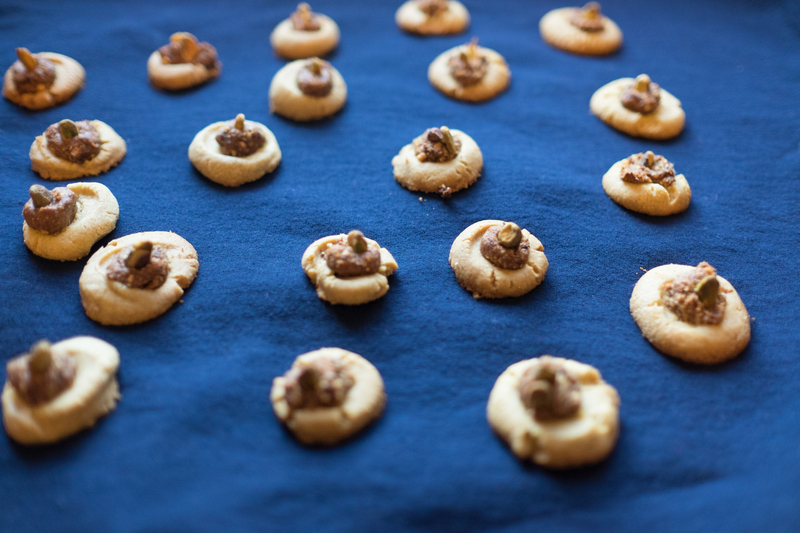 Line the cookies onto baking sheets and bake for 30 minutes until edges are brown. My heart is always eased a little when I see that you have been with family…both our blood relatives as well as the family we have created over the years. 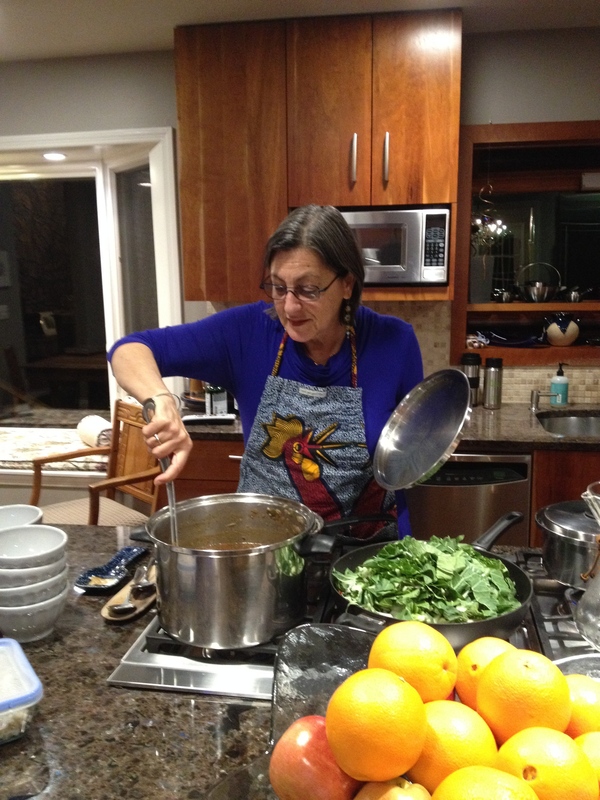 Knowing that you seek out the blessings of family…where love and connections are the undercurrent of everything, where life’s milestones are celebrated and traditions are transcended and where food and kitchen secrets are shared…is a comfort to me. Most of all, I am comforted to see you safe and surrounded by love and friendship. 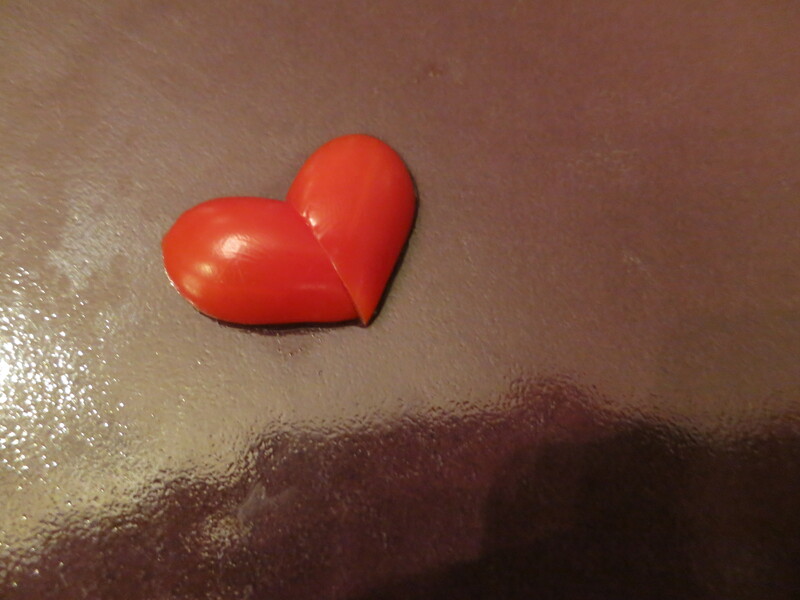 Never too old to learn how to do something new with a grape tomato! My comfort was short-lived when I heard about your day trip to Ramallah. I am all for a girl’s day out at the spa…but Ramallah?! You tell me it’s safe. Everyone else tells me, you are out of your mind! I remind myself that you are responsible (most of the time), you are not really a wild risk taker (calculated risks only, I pray) and that you have traveled the world and survived (pooh, pooh, pooh!). I still get scared. I know that your life is beyond my control and I pray fervently, everyday, for your safety, your health, your well-being, your happiness…and a strong dose of mazel. Prayer is a pretty flimsy substitute for control, but it’s all I have and I’m counting on it. But just in case, would you mind just being a little more cautious with your life…for my sake (and your father’s)?! I am counting the days until you get home for Passover. I am only truly at ease when you are right under my nose. 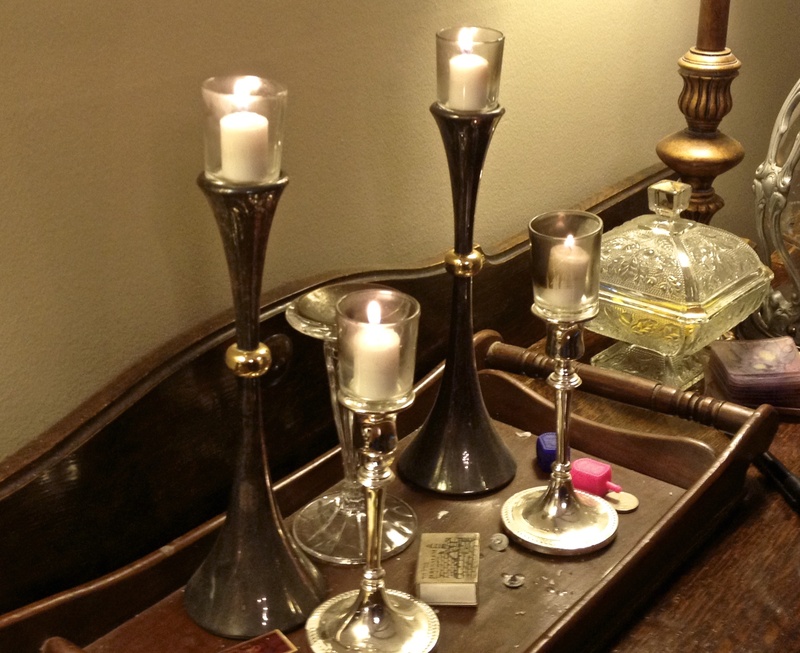 I am working on planning our concurrent Birmingham/Israel Shabbat dinner….Birmingham parents with kids living in Israel sharing Shabbat here while their kids share Shabbat in Jerusalem. It’s a great idea…now let’s see if we can pull it off. You need to let me know what’s on your menu so I can introduce the parents to a taste of what their kids might have eaten at your house eight hours earlier. Dad is on a ski trip with the boys and has chosen yoga over skiing as his sport of choice on this trip. Along with his drum sticks and practice pad, I am certain he will entertain himself and get an adequate workout. I feel like I am a yoga evangelist. I am glad to hear that you are now enjoying your new yoga class. Now if you can only learn to spare your poor feet a little…a ten and a half mile run…no wonder your feet hurt! A whole lot of avoidance! I have been working on taxes (my annual descent into receipt madness) and baking (my go-to avoidance activity) hamentaschen for Purim. 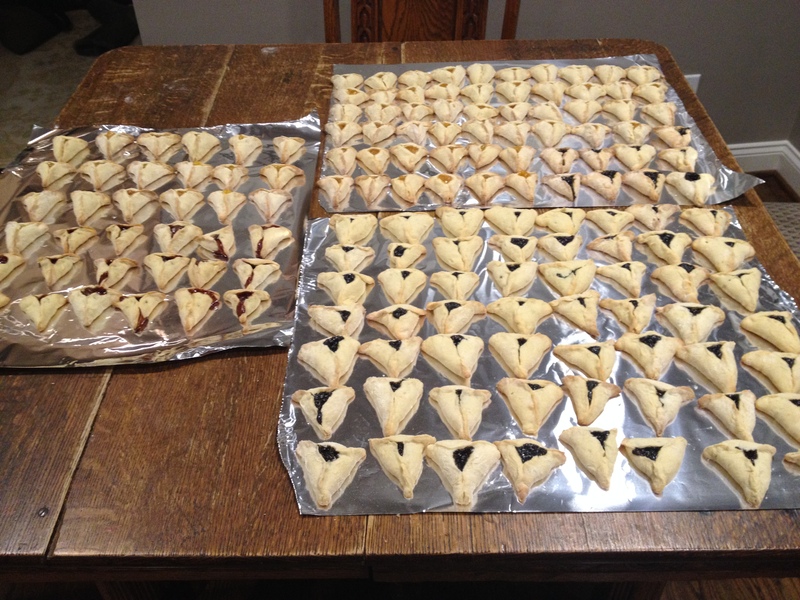 I made over 250…half for the Chesed Committee at temple and the rest to enjoy and give away. Dad’s favorite is cherry, even though I made some chocolate-peanut butter chip-caramel just for him. There will be a few waiting for you in the freezer to enjoy before we begin our Passover cook-a-thon. Please take care of yourself…remember all my eggs (and I only have one) are in one basket…and you are the primary bearer and caretaker of that basket! Options: poppy seed, cherry, strawberry, chocolate chips, prune, raisin and nuts, almond filling or your favorite jam. Make your own: combine fruit (prunes and raisins work well) with a little orange juice and sugar and cinnamon to taste and cook over low heat until thickened. Nuts may be added. Be creative! Bring all ingredients to room temperature. Cream the sugar and butter in a large bowl. Add the vegetable oil and eggs and beat until blended. Add orange juice, zest and vanilla and mix together. Combine flour, baking powder and salt in another bowl and mix together. Mix dry ingredients into the large bowl with wet ingredients. Knead dough into a ball. Divide into 4 balls of dough and wrap in clear plastic wrap. Refrigerate for at least 2 hours or overnight. Dough may be kept in the refrigerator for a week or may be frozen for up to a month for later use. Work with one ball of dough at a time, keeping remaining dough refrigerated. Roll out dough on floured surface to ⅛ inch thickness. Cut in 2 ½ to 3 ½ inch circles (the metal lid band from a wide-mouth canning jar or the jar itself make the perfect size cookie cutters). 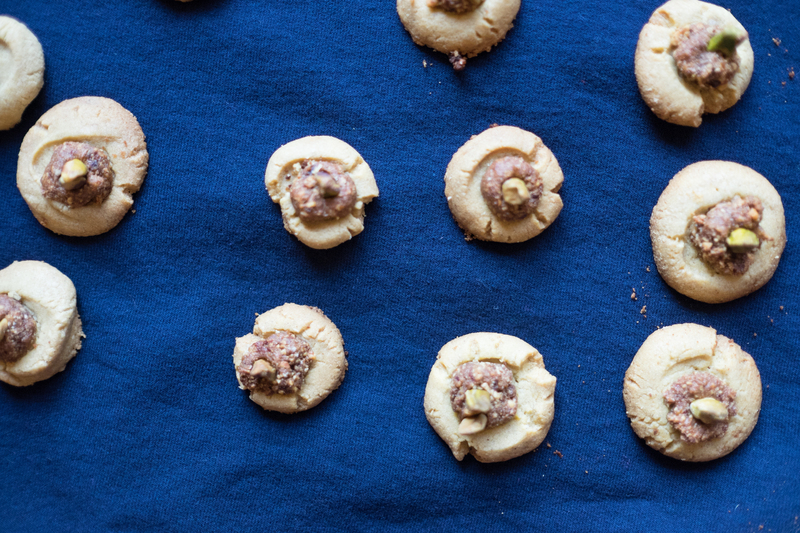 Put a rounded teaspoon of filling in the center of each circle. Pinch the sides and top together to make a triangle shape. 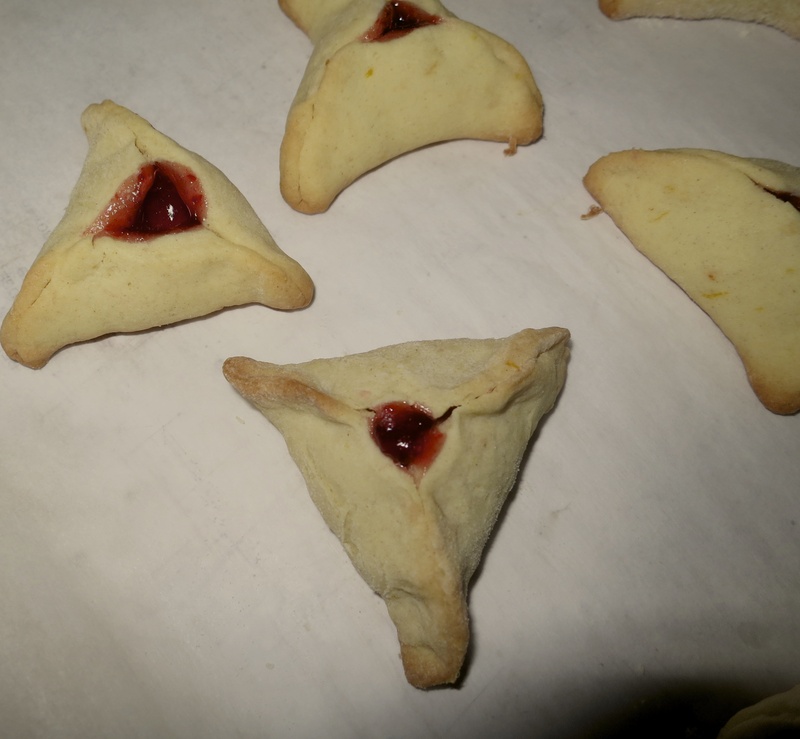 You can use a smaller glass or circle cookie cutter and less filling for smaller hamantaschen. Place on an ungreased baking sheet lined with parchment paper and bake for 14 to 16 minutes until edges are lightly browned. I am not really a meat chili person, but this was so intriguing that I had to try it and it was delicious! Not to mention that it turned out to be the perfect thing for those weird cold days we had this winter. You will probably never make this dish, but some of your meat eating friends might want the recipe anyway. This dish made me fantasize about having a chili party next winter…White Chili made with chicken, Chinese Chili made with brisket and our family classic…Vegetarian Chili made with tofu. It’s a thought…. This recipe is adapted from one Dad found in the newspaper…of course I had to add a few of my own touches. It makes enough to feed a crowd! Start with a 8-10 quart dutch oven or soup pot. Trim the fat off the brisket reserving a small piece (about 2 tablespoons) of fat. Throw any remaining fat away. Lightly brown the reserved fat on medium-high heat in the dutch oven to slick the bottom (this piece of fat can be discarded after being browned). Cut the trimmed brisket into 1/2 inch or 3/4 inch cubes. Add the chunks of brisket to the pot and cook until the meat loses its redness. Transfer the seared meat and juices to a bowl and toss with soy sauce and hoisin sauce and let stand while preparing the vegetables. Reduce heat to low and add onions and mushrooms to the Dutch oven. Sauté until soft. Add carrots and peppers and continue cooking. Garlic, ginger and hot peppers can be finely chopped together in a food processor and added to the vegetables. Add spices and beer and bring to a simmer. Add tomatoes. Add meat with marinade and juices. Cover and simmer until meat is tender and flavors are well blended. This could take 3 hours and tastes even better the next day. Stir in vinegar and adjust seasonings with soy sauce and salt. 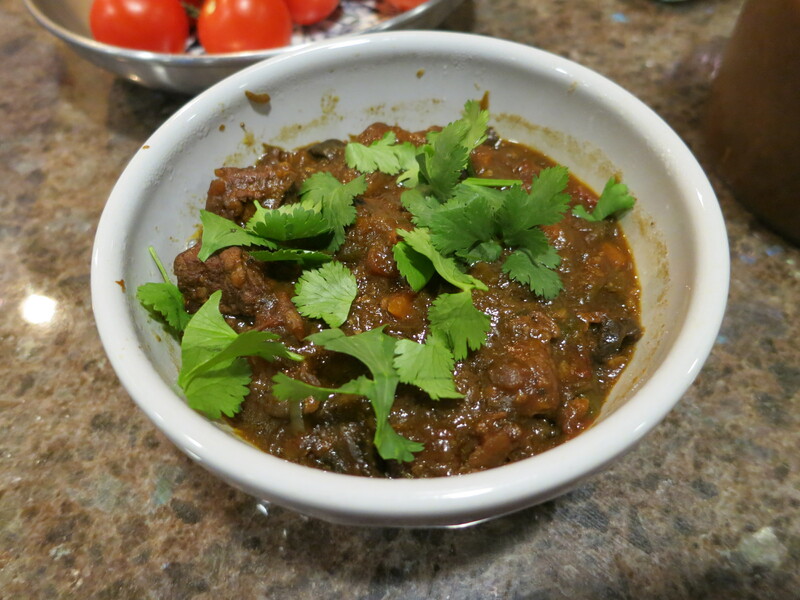 Garnish with cilantro and serve with black beans and brown basmati rice. This dish gets better the longer it cooks and can be made a few days ahead of time. It also freezes well.